The following article will offer some background information about Lithic Casting Lab and how it began. It's from a 1998 April issue of "Mammoth Trumpet." A publication that is devoted to the study of the Earliest Americans and published by The Center For The First Americans. The "Stone Age Artifacts Of The World" picture will probably always be my favorite. It took two weeks to lay out. 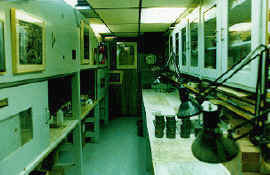 But it also took months to coordinate the project, working with large and small collections from across the country. 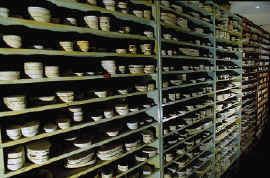 The largest collection was the Smithsonian Institution and the smallest were private collections. What is most exciting about this picture is that these artifacts represent a span-of-time in which all humans have existed. They also show how complex stone tool technology really was. There are two bifaces (large blades) in this picture, the "Sweetwater Biface" and a 24" biface from Mexico that no one has yet been able to duplicate in modern times. They are good examples that illustrate how skillful some of these early flintknappers were in making stone tools. The entire Industrial Revolution has only lasted no more than the life time of two people, if they lived to the oldest age and back-to-back. But the Stone Age lasted for millions of years. If it wasn't for the long lasting durability of stone our knowledge of the past would be greatly diminished. "The Art Of Preserving The Past"
If you were to visit the world's largest repository of molds and master molds of important Stone Age tools you would have to travel through the southern Illinois cornfields to Troy, Illinois, for it is there that Pete Bostrom operates his Lithic Casting lab. Known internationally in archaeological circles for the high quality of his casts of Stone Age artifacts, Bostrom has devised many of his own methods in what has evolved into a complex multi-step casting process that ultimately results in molds, master molds, and finished casts that look almost exactly like the original artifacts. Bostrom believes he is probably the only person doing this specialized craft as a full time occupation. 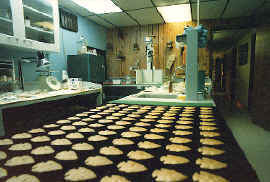 The Lithic Casting Lab "has in the past" specialized in the replication of prehistoric stone artifacts for museum displays, teaching aids, reference collections, and for special situations such as casting artifacts that will be damaged when samples are cut from them for thin-section or obsidian hydration dating analysis. Bostrom has also molded and cast artifacts that need to be examined under a scanning electron microscope but will not fit inside the instrument; selected areas for study can be cut from the cast and the artifact itself is left whole. Learning how to maintain good edge detail and how to cast large items so that they are detailed and free of air bubbles has taken the 49 year old Bostrom years of trial-and-error experimentation. He told Mammoth Trumpet that he has never heard of anyone else doing some of the procedures that he does. It's an expensive and time-consuming process, but over the years he has cast hundreds of artifacts from many federal agencies including Bureau of Land Management, Bureau of Reclamation, Forest Service, National park Service, and the Smithsonian Institution. He has done casting projects for a large number of states, counties, museums and universities. 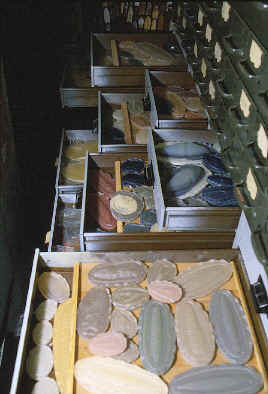 His casts inevitably cause excitement-and-sales among collectors, flintknappers and within the professional community. Bostrom's interest in archaeology dates back to his childhood. 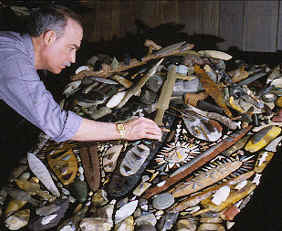 He began surface-collecting artifacts in Illinois in the early 1970's. After serving in Vietnam, he returned to his job at General Motors and in 1973 built a 70 by 26 foot building that he used to raise and sell tropical fish. An influx of fish imported from Asia made fish breeding impractical, so he returned to his original interest-archaeology. Bostrom was employed for more than 21 years by General Motors, and it was only in 1987 that he took an opportunity to leave and begin to work full time casting artifacts. Finding himself interacting daily with Old World and New World archaeologists, collectors and flintknappers, Bostrom learned that these four groups often have conflicting points of view, but he says that each has something valuable to offer. The most unusual cast that Bostrom ever did was a series of Bigfoot tracks that belonged to the Forest Service. In about 1985 he made molds of three plaster casts of large footprints discovered in Washington state that showed visible dermal ridges and sweet pores--one of the prints showed a flexible foot bending around a rock. Bostrom is amazed at the number of people he meets who have stories about Bigfoot. He says they make for great campfire conversations. Bostrom has accumulated thousands of master molds and casts of artifacts from cultures worldwide over a 25-year period. At least 46 Paleo-Indian sites are represented in the collection, including Mesa and Moose Creek, Alaska; Blackwater Draw, Colby, Domebo and Drake in the West; Bostrom and Kimmswick in the Midwest; Dutchess Quarry Rock shelter, Thunderbird and Vail in the East. He also has molds of artifacts from important Old World sites such as Abbeville in France, Kalambo Falls in Zambia, Mezhirich in Ukraine and Olduvai Gorge in Tanzania. 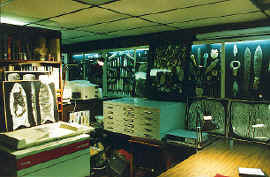 Years ago Bostrom decided that he also needed to make a photographic record of some of the more uncommon artifacts that were coming through his laboratory. He has perfected a method for depicting both sides, as well as an edge view of an artifact, in a single photograph. Using a large-format camera, he takes a triple exposure on a 4x5 negative. He then transfers the image to a slide that presents the 'impossible" perspective of all three views at once. He uses an 8x10 inch camera when photographing artifacts.